Like Splunk Inc (NASDAQ:SPLK), Salesforce.com, Inc. (NASDAQ:CRM) and others, Workday Inc (NASDAQ:WDAY) has been on fire. While the broader market is still trying to claw back from its early February losses, these cloud stocks have been hitting new all-time highs. Should we stick with Workday stock or look to ring the register? A few weeks ago, Workday beat on earnings per share and revenue expectations. Sales grew a whopping 32% year-over-year (YOY), while subscription revenue and its backlog also tallied YOY gains north of 30% for the quarter. This rate is working well for Workday, which also grew operating cash flow ~33% for the year. Impressively though, free-cash flow exploded 41% in fiscal 2018. 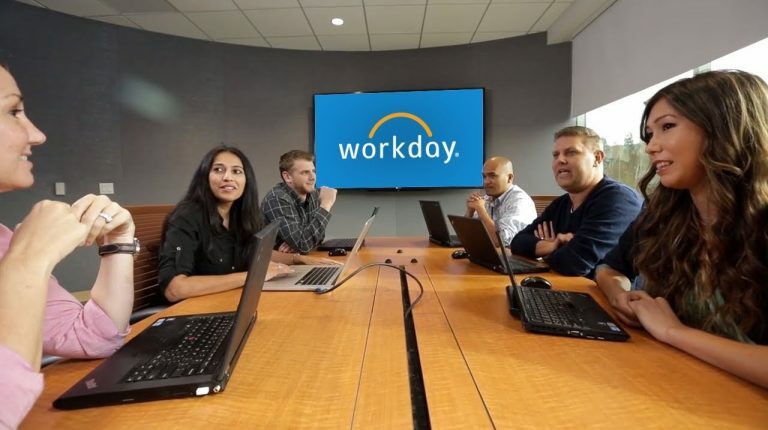 There’s clearly momentum in Workday’s business and that’s translating to momentum in WDAY stock. With that in mind, how high can Workday stock go? Since the company’s earnings report, there have been several analyst re-ratings. A number of targets now rest between $120 and $140, with the average analyst price sitting at $128.27. Because of the stock’s 7% rally since its earnings and 33% rally so far on the year, this target is actually about 5% below Workday’s current stock price. However, there is a lone target up at $150, up about 10% from current levels. Can Workday stock rally to this point? This should aid in further momentum to its business. As it stands, analysts expect revenue to grow about 25% in fiscal 2019 (this year) and 23% next year. So while this is a drop from fiscal 2018’s results, Workday is expected to churn out another eight quarters (at least) of strong sales growth. While gross margins seem to be plateauing, operating and net margins are still climbing. So, as long as that remains the case for the next 24 months, Workday’s bottom line should continue to swell. If its cash flow situation is any indication, that very well could be the case. That’s likely one reason investors have been bidding the stock higher. On a GAAP basis, Workday is not yet profitable. On a non-GAAP basis, it is. Analysts are looking for 17.5% earnings growth this year and 36% the following year. For 2018, they expect earnings of $1.21 per share, meaning Workday stock trades at more than 100 times this year’s earnings. Between a high valuation and Amazon.com, Inc. (NASDAQ:AMZN) reportedly readying a corporate training product of its own, investors may become worried about WDAY’s future prospects. After all, Amazon Web Services is one of the biggest players in the cloud and that could negatively impact Workday moving forward. So, what do the charts say? While Workday stock may have the wind at its back, shares seem ripe for a pullback. From May 2017 through January, WDAY stock was trading within a rising channel. However, in February, shares broke out of this range and went on a steep rally. 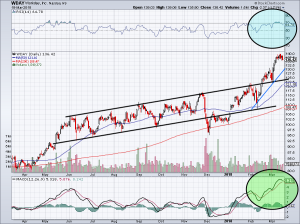 At the end of February, Workday stock pulled back and found support along the upper edge of this channel. That was a bullish move, as confirmed by the stock’s 12% rally since. The stock’s MACD indicator, which measures momentum, looks to be losing steam (green circle). The RSI measures how overbought or oversold the stock is (blue circle). While the reading no longer supports an overbought reading, it could still unwind some more while WDAY stock pulls back or consolidates. Finally, a retest of the upper channel line should be in the cards. This level could quickly turn to trend-line support, which would be very bullish for Workday stock. Particularly if the rising 50-day moving average comes into play as well. So how do we play this? 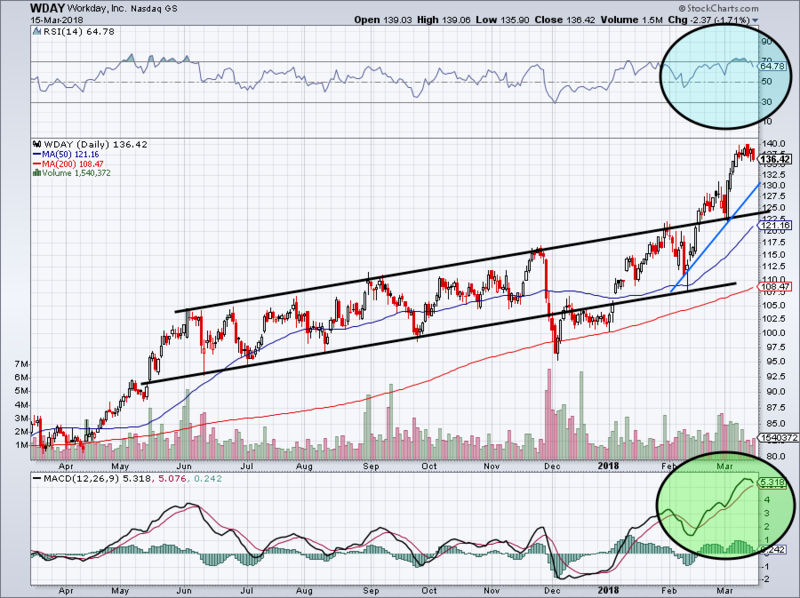 Look for a pullback in WDAY stock into the $126 to $130 area. For now, the trend is definitely higher despite its rich valuation and possible AMZN threat. Should the top of this channel hold as support, shares should continue higher and it will put Berg’s $150 target in play as well. Bret Kenwell is the manager and author of Future Blue Chips and is on Twitter @BretKenwell. As of this writing, Bret Kenwell held a position in CRM. Article printed from InvestorPlace Media, https://investorplace.com/2018/03/why-workday-stock-heading-150/.